Get your SIMON Savings Passport and More! We are excited to announce that OutletBound.com has partnered with SIMON Shopping Destinations, a select group of over 70 world class outlet shopping destinations across the United States, including SIMON's Premium Outlets and Mills shopping centers! 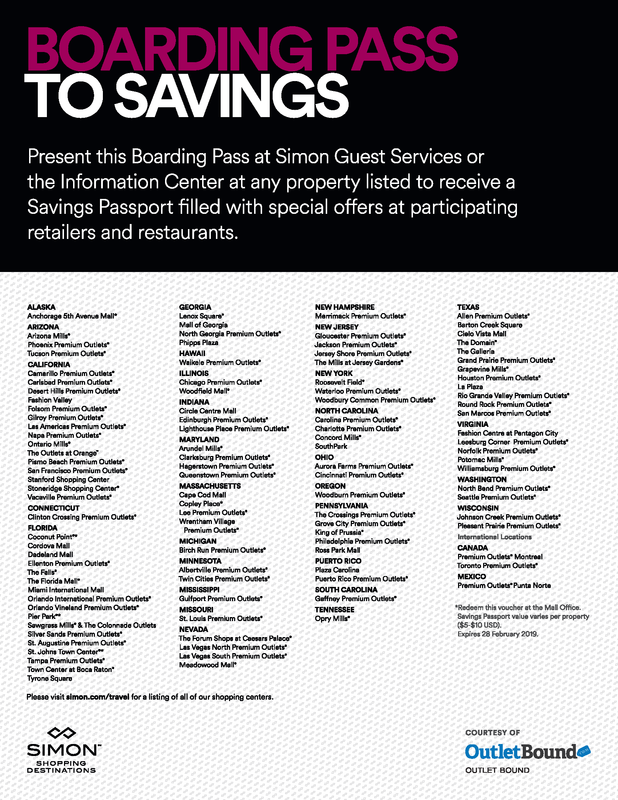 Save even more on your outlet shopping with the SIMON Savings Passport! Simply present this voucher to Customer Service at over 70 participating SIMON Premium Outlets and Mills shopping centers across the U.S. to receive your exclusive Savings Passport, filled with special offers for participating retailers and restaurants. Use our interactive outlet mall map to find SIMON outlet shopping destination locations anywhere in the the U.S.